The world of merchant accounts and credit card processing is constantly changing, especially with new technology and services constantly being developed and offered. We present here questions and answers and helpful articles to keep you educated on new and trending subjects. 1. How does credit card payment processing work? 2. How do the new IRS rules for transaction reporting affect me and my merchant account? 3. What is Near Field Communication (NFC)? 4. How will the new Google/Android relationship with MasterCard/Citi Group/Verifone change Near Field Communications (NFC)? 6. Where are things headed with mobile phones and mobile payment services? 7. What are the Interchange Table rates for Visa and Mastercard? 8. What are the California Public Utilities Commission's (CPUC) requirements for diversity in contracting? 9. What are the requirements of the Payment Card Industry Data Security Standard Compliance (PCI DSS) Program? 10. What is the best way to handle chargebacks? 11. My PIN pad has stopped working - how do I get it fixed? B. Settlement (processing the sale which transfers the funds from the issuing bank to the merchant's account). 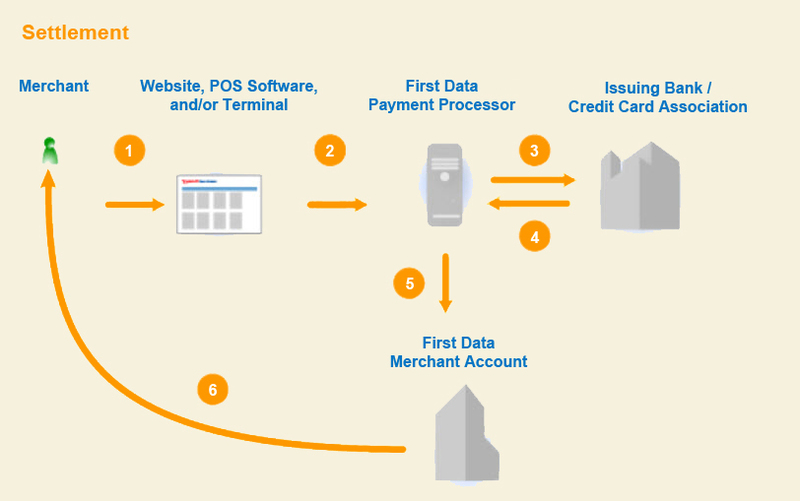 The flow charts below represent the key steps in the process starting from what a customer sees when placing an order through completing the sale and finishing with the merchant processing the sale to collect funds. When the buyer clicks the "Checkout" button, they are sent to secure servers to complete the checkout process. The Buyer (cardholder) places an order at the merchant's site by clicking the "Send Order" button on the Review Order page during checkout. The merchant's gateway sends the authorization request to First Data Merchant Services (FDMS), the payment processor. If approved, the amount of the order is reserved from the total of available credit for the cardholder. The issuing bank (or Credit Card Association) sends the authorization response to FDMS. The authorization response consists of either an approval along with Address Verification System (AVS) and Card Verification Value (CVV) response codes or a decline. FDMS adds response codes to the authorization response and passes the authorization back to the merchant's gateway. If the merchant has enabled Risk Tools, the rules set by the merchant will be run when the response is received from FDMS. The authorization (if approved) is stored on secure servers at First Data for later processing by the merchant. If declined, the buyer (cardholder) is informed and asked to try a different payment method. If the authorization is approved by the issuing Bank (Credit Card Associations) then the buyer (cardholder) is taken to the Order Confirmation page. The merchant signs in to their account and goes to the Order Manager. The merchant reviews the order (including AVS and CVV response codes) for signs of fraud. When ready to complete the sale, the merchant clicks the "Sale" button in the transaction panel of the order. Clicking "Sale" initiates the settlement process. The sale is then stored in a batch for settlement requests which are submitted each night. By default, batches are submitted nightly between 6-11 pm (PST). Merchants can also choose to submit batches manually. The settlement request batch with all completed sales is sent to First Data Merchant Services (FDMS). FDMS submits the settlement request for the buyer's order to the Issuing Bank/Credit Card Association of the buyer on behalf of the merchant. The Issuing Bank/Credit Card Association sends the response to the settlement request back to FDMS. If the request is accepted, the buyer (cardholder)'s account is debited for the amount of the order. It is possible that the settlement request will be declined; for example, if the buyer has exceeded their credit limit between the time of the authorization and settlement. FDMS sends the approval and details of the payment to the merchant's bank (Merchant Account Provider). The settlement of funds between the issuing bank and the Merchant Account Provider then occurs. Following the settlement, the Merchant Account Provider credits the merchant's account. For information about when funds will be deposited, contact your merchant account provider. Often nascent markets need bold leadership. I think (imho) this gives NFC such a push. Are there hurdles yet to come, of course. I find it funny that people are so dismissive of NFC because it has been around a long time. I will say, Ethernet was around for about a decade before it became ubiquitous and then it was Token Ring from IBM that was so superior. Anyone out there using Token Ring today......didn't think so. NFC offers consumers convenience, security and a one place for everything on an interactive device. The Magstripe is 50 years old, retire it already. Google was smart to include Citi, MC and First Data. Why, because e-companies don't understand the complexity around money, these guys do. The finance guys were smart to partner with Google because these guys don't understand innovation and Google does. As for Google Checkout failing, luckily Apple didn't listen to the naysayers about how they could never the do the iPhone because Newton sucked. MAY 26, 2011, NEW YORK, NY -- At an event today, Google, Citi, MasterCard, First Data, and Sprint announced and demonstrated Google Wallet, an app that will make your phone your wallet so you can tap, pay and save money and time while you shop. For businesses, Google Wallet is an opportunity to strengthen customer relationships by offering a faster, easier shopping experience with relevant deals, promotions and loyalty rewards. "Today, we've joined with leaders in the industry to build the next generation of mobile commerce," said Stephanie Tilenius, vice president, commerce and payments, Google. "With Citi, MasterCard, First Data, and Sprint we're building an open commerce ecosystem that for the first time will make it possible for you to pay with an NFC wallet and redeem consumer promotions all in one tap, while shopping offline." While no one can completely predict the future, the following information taken from an Atlantic Trend article about Barry McCarthy, First Data's General Manager of Asia/Pacific, Alliances and Government Solutions provides some insightful observations about the future. Read the full article here. The public utilities code requires the commission to establish procedures for utilities to submit plans for increasing the involvement of women, minority, and disabled veteran business enterprises (WMDVBE). If you are a gas, electric, or telephone utility with gross annual revenues exceeding $25M, you should review PUC General Order 156 to ensure compliance. 9. What are the requirements of the Payment Card Industry Data Security Standard (PCI DSS)Compliance Program? The Payment Card Industry Data Security Standard (PCI DSS) is an information security standard for organizations that handle cardholder information for major debit, credit, prepaid, e-purse, ATM, and POS cards. The standard is defined by the Payment Card Industry Security Standards Council. The current version is 2.0. The chargebacks mechanism exists primarily for consumer protection. 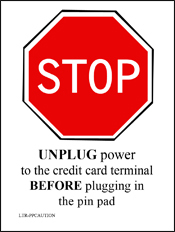 U.S. credit card holders are afforded reversal rights by Federal Reserve Regulation Z under the Truth in Lending Act. U. S. debit card holders are guaranteed reversal rights by Federal Reserve Regulation E under the Electronic Funds Transfer Act. Similar rights extend globally pursuant to the rules established by the corresponding card association or bank network. 11. My PIN pad has stopped working - what do I do? Contact your Ignite Payments sales representative and explain the problem. Your sales rep will provide information for shipping the problem terminal. Turn around time can be up to three weeks.